I recently decided to redo my home network setup with all new parts in an effort to get my cable company to step up and provide the service they are supposed to. You see, they like to blame slow network speeds on customer equipment 100% of the time no matter what, so I thought I would just nip that in the bud. One part of the upgrade involved replacing all the old Ethernet cables in the house; after some research I decided to go with Category 6 network cables, and after some price and quality comparisons I decided to go with the Rosewill brand. For my network, the cable modem plugs into a wireless router which then plugs into the two computers in the main room. From that router, a 25 foot Ethernet cable goes up the wall and across the ceiling into the other room, where it plugs into a network switch that in turn plugs into two additional computers. 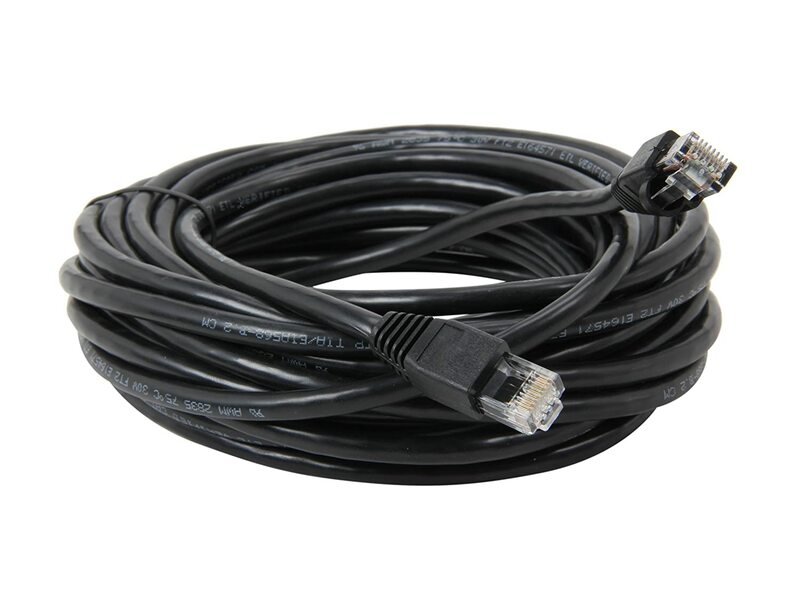 For that 25 foot cable length I replaced my old Cat 5e cable with this black Rosewill 25' Cat 6 Network Cable. I also replaced the router, the switch, and all the patch cables going from the network devices to the individual computers. 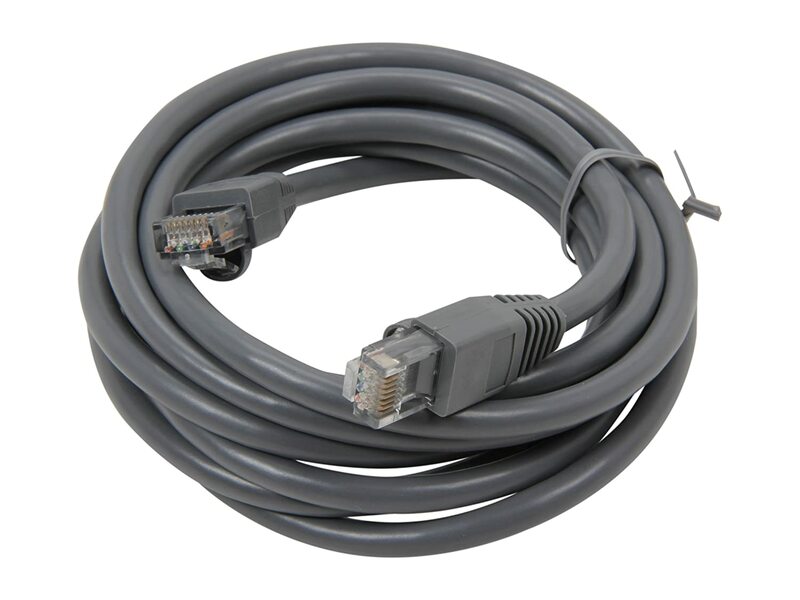 The first thing to note about Cat 6 cable is that it is backwards compatible with Cat 5/5e cables, which means you can swap it into existing applications without issue. Both cables use the same connectors and contain four pairs of twisted wires inside a sheath, but Cat 6 cables typically use larger (22 AWG) wire than Cat 5 cables (24 AWG) to help reduce impedance, crosstalk and structural return loss. This particular cable came packaged in a sealed plastic and foil bag. It was coiled up nicely in a big coil to prevent kinking, and twist-tied together on one side. The first thing I noticed when I opened the package was that the cable was noticeably thicker than the Cat 5e cable it replaced, and thus wasn't quite as flexible. It still had plenty of flex to it, but if I laid it down on the floor it tended to fall back into a coil shape or a straight line rather than just flop all over the place. I had no problem routing it up the wall and the along through some looped hooks in the ceiling. One thing I don't particularly care for that others might like is the little rubber protective cover that surrounds the clip on each end of the cable. This makes it so you don't snag the clip on things and break it off, but at the same time it makes the cable harder to remove since the rubber is a little stiff. Personally I grabbed a pair of wire cutters and cut off the protective cover on all my new cables to make it easier on myself later. Network speeds are the same as before, with the hard drive being the limiting factor in transferring across the local area network and the terrible 1.5mbit cable being the limit over the internet for me. I went with 10/100 BASE-T networking, but this Cat 6 cable would work just as well for Gigabit Ethernet if I had chosen to go that route. It meets all EIA/TIA Cat 6 TIA/EIA- 568-B-2.1, draft 9 standards and has a gold-plated RJ-45 male standard connector on each end. I'm very happy with this cable. It's currently selling on Amazon for $5.99 and on Newegg for $4.49 with free shipping; when I purchased my cables a couple of months ago on Newegg it was $4.99 and had a 20% off promotional code, which made it a heck of a deal. I picked up a second one to keep in my box of extra cables as a spare, and I would easily recommend this cable. Since we had our son in May my fiancee has been taking loads and loads of pictures with her phone and quickly filled up the 8GB memory card she had. I decided that we would just skip getting a 16GB memory card upgrade and go straight for the 32GB card, which is the maximum amount officially supported by the Motorola DROID 4. I heard some people had luck with 64GB microSDXC cards if they were reformatted, but I didn't want to chance it. Newegg had a couple of cards in one of the email newsletters that week; one was a Team Group class 4 card for $16 and the other was a class 10 card from Silicon Power for $20. I have one USB flash drive from each company on my desk and I was unhappy with the speeds of both, so I decided to get the class 10 card for the extra $4. I figured if the speeds weren't up to par, they would still be good enough if I purchased the faster card to start with. The card is a microSDHC card and comes with a microSD to SD adapter so that you can use it in things like laptops and printers that may have an SD card reader built in but not a microSD one. I do have a USB card reader that will take either one, but the old laptop we have will only take full size SD cards so it was nice that they included this. This also makes it possible to use the card in devices like cameras that take full size SD cards in the first place. 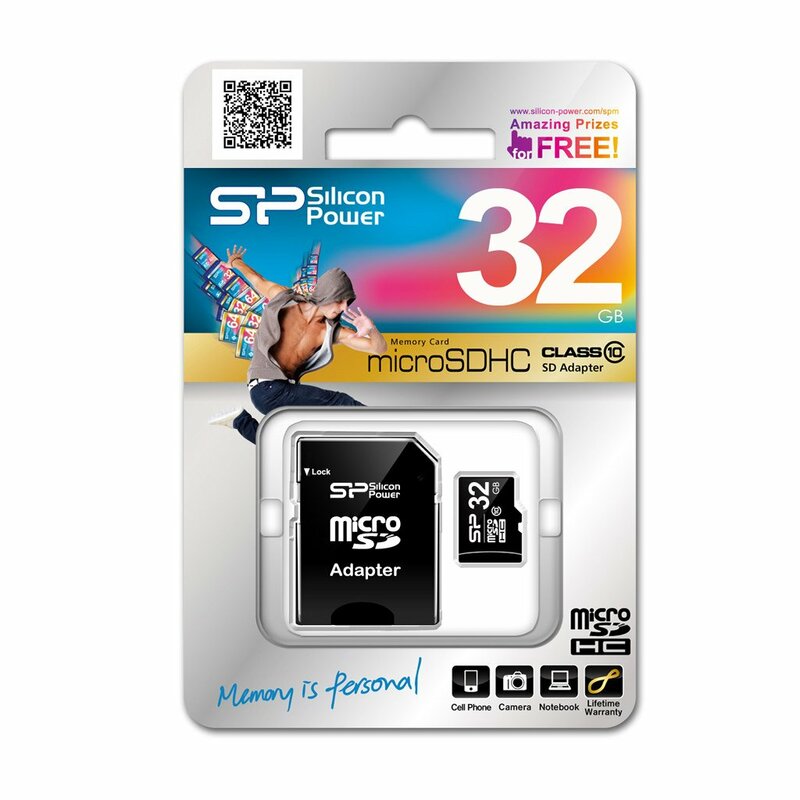 This Silicon Power microSDHC card comes pre-formatted with the FAT32 file system and has a total capacity of 31,902,400,512 bytes (29.7GB). It is a solid black, standard sized card (about 15mm long, 11mm wide and 1mm thick). It also has the standard notch on the right side so that it can't be inserted upside down. The included SD adapter is also notched for correct insertion and features the normal write-lock switch that you can slide down to make the card read-only until you slide it back up. 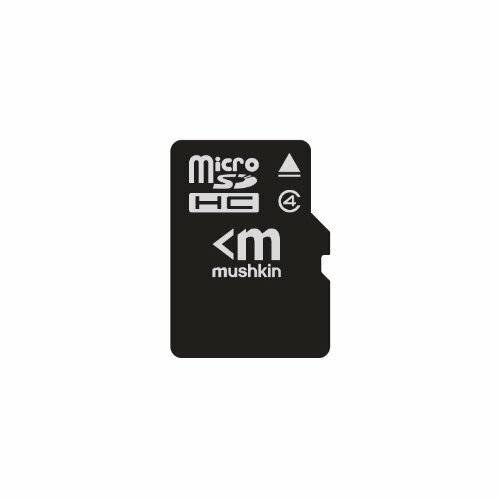 This card is designed for high-speed continuous shooting capability, and the class 10 speed rating means the card should write at a minimum speed of 10MB/s. Benchmarks were taken using CrystalDiskMark 3.0.1c at the default settings. As we can see this card just meets the class 10 requirements for writing sequential and 512k random chunks of data. Good enough to write HD video streaming from the phone's camera anyway. It's not a bad card and it does work well in the phone, but I'm a bit disappointed overall that the speeds aren't a bit higher considering it's a class 10 card. This class 10 card is comparable across the board to the 16GB class 4 Patriot Signature card that we picked up for my brother's phone; a little faster in a couple of the tests and a little slower in a couple others. It is fast enough that Windows offered to let me use it for Windows ReadyBoost when I inserted the card reader with the card in it. The cards are RoHS compliant and fully compatible with the SD 2.0 standard. They have built in Error Correcting Code (ECC) and are rated for a minimum of 10,0000 insertions. They can be used in an operating temperature of 0ºC to 70ºC, and stored in temperatures ranging from -25ºC to 85ºC at between 8% and 95% humidity. These cards are assembled in Taiwan and feature a lifetime warranty. I'm fairly happy with the card in general, but I wish it was a little faster since it's barely an improvement over the class 4 card from Patriot. Three stars. 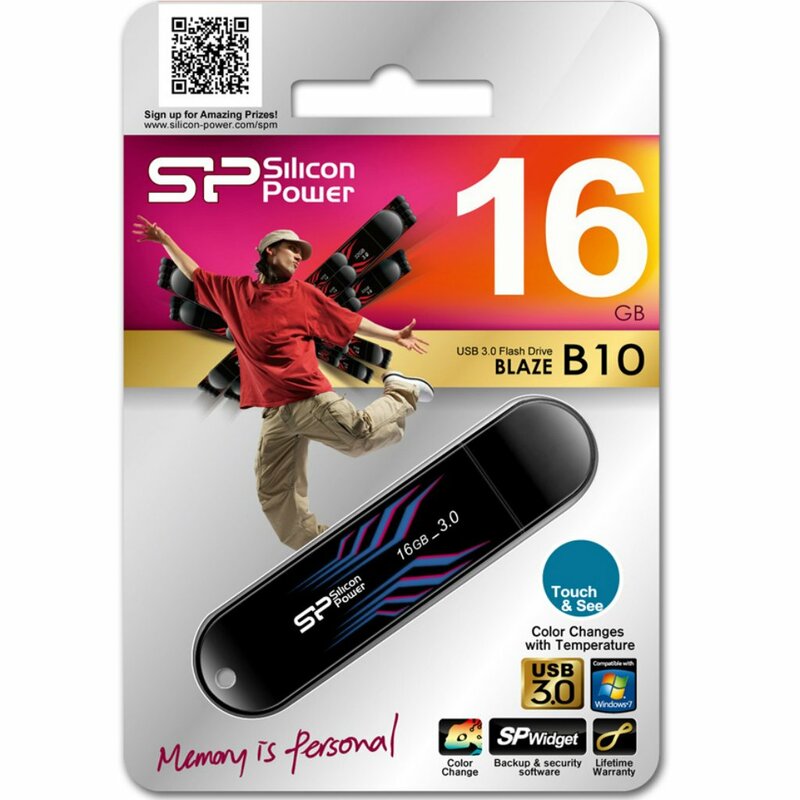 I picked up this Silicon Power Blaze B10 16GB Flash Drive on Newegg during one of their Shell Shocker deals for $10.99 with free shipping. It seemed like a pretty good price for a USB 3.0 flash drive to me, and all of my other flash drives were only USB 2.0. Only two of the computers in the house support USB 3.0, but I figured when I needed to copy stuff to or from one of those computers this would be a lot faster than using one of the USB 2.0 drives so I really wanted to pick one up. Since this one was a good price, I decided to give it a shot even though I had no experience with Silicon Power products in the past. It's a pretty standard sized flash drive, measuring just under .5" thick, .75" wide and 3" long. It feels like it is made out of really cheap, thin plastic and has a cap that could be easily lost. It has rounded corners and a hole for a lanyard or key chain on the end of it. The USB plug itself is blue instead of black because this is a USB 3.0 drive, which is nice because if I forget which drive was the fast one I could tell at a glance (not withstanding the fact that it says 16GB_3.0 on the front). The whole drive is black except for the "futuristic geometric pattern" which is really just a series of angled lines. These lines are mostly Turkey Blue in color when the drive is cool, and they turn Blaze Red when the drive warms up for any reason (contact with skin, normal operating, getting placed in the heat). It doesn't take a whole lot of temperature to make it turn colors, and in fact it has sat here red most of the time on my desk because of the 90ºF temperatures lately. The activity LED is also red, which is only noteworthy because I think the LED in every other flash drive I have is blue. The drive comes formatted with the FAT32 file system and has a capacity of 15,502,147,584 bytes (14.4GB). It's fast enough to be used by Windows ReadyBoost even when plugged into a USB 2.0 port. These benchmarks were taken using CrystalDiskMark 3.0.1c and the default settings. As you can see from the following benchmark the USB 2.0 performance is pretty good when it comes to reading data, but the write speed is abysmal and very disappointing. Well it can only get better by plugging it into a USB 3.0 port right? That's the whole reason I picked this particular drive up anyway, so lets give it a shot. If it's fast with USB 3.0 then I'll be happy with the drive for this price and it should serve its purpose well. The drive advertises up to 70MB/s read speed and up to 20MB/s write speed, so let's see how it fares. What?! Yep, I had to verify that it was indeed plugged into one of the USB 3.0 ports and then I had to run the test a couple more times just to make sure. It's just nowhere near the speed it should be, and in fact is the slowest flash drive I've tested to date. Absolutely horrible speed all around, except in the sequential read and write tests where it had an average score. The sequential speeds are the least important too, as it's not often all of your data is going to line up sequentially so you're much more likely to get speeds closer to the random 512k or 4k random speeds on average. So what can I say about the Silicon Power Blaze B10? Stay away. Even for the low price tag I picked it up for during Newegg's Shell Shocker deal it was absolutely not worth it. 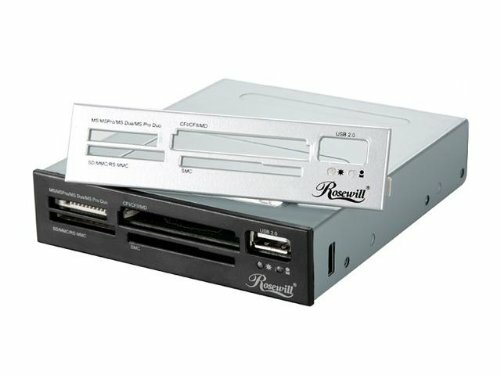 What possible purpose could you have in picking up a USB 3.0 drive that is slower than most USB 2.0 drives? Sad and disappointed is what I am; this flash drive gets a 1-star rating from me and I don't recommend it to anyone for any purpose.